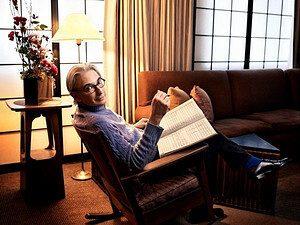 In March, conductor Michael Tilson Thomas returns to New York for performances with the Vienna Philharmonic as part of his 2018–19 Carnegie Hall Perspectives series. The series, which marks MTT’s second time being honored as a Perspectives artist, began in summer 2018 when he led the National Youth Orchestra of the United States of America at the hall and on tour to Asia, and continued in the fall when he opened the Carnegie Hall season with the San Francisco Symphony. On Tuesday, March 5 at 8:00 p.m., MTT conducts the Vienna Philharmonic in Ives’s Decoration Day, Beethoven’s Piano Concerto No. 3 featuring pianist and 2018 Gilmore Artist Igor Levit, and Brahms’s Symphony No. 2. The next night, on Wednesday, March 6 at 8:00 p.m., he leads the orchestra in Mahler’s Ninth. MTT conducts these programs at Carnegie Hall after having led the Vienna Philharmonic in both during January. The first concert, Mahler’s Ninth at the Musikverein, was described as a “poetically charged performance” by the Wiener Zeitung, which also said: “At the end, you really didn’t want to believe it was over.”* Following this performance, MTT, the orchestra, and Igor Levit toured the Ives, Beethoven, and Brahms program to Germany, Hungary, Switzerland, and back to Austria at the Vienna Konzerthaus. The final concerts in his Perspectives series are in May with the New World Symphony, which he has led as Artistic Director since co-founding the organization more than 30 years ago as a training ground for the next generation of classical musicians. He conducts two premieres: the world premiere of an NWS and Carnegie Hall co-commission from Julia Wolfe on Wednesday, May 1 at 8:00 p.m. and—at Zankel Hall—the New York premiere of MTT’s Four Preludes on Playthings of the Wind on Thursday, May 2 at 7:30 p.m. Both programs feature soloist and fellow Perspectives artist Yuja Wang. MTT conducts NWS in the 2016 world premiere of Four Preludes on Playthings of the Wind, featuring Measha Brueggergosman as lead vocalist. At the New World Symphony this February, a busy three weeks of concerts and coaching culminate in MTT conducting a WALLCAST® Concert with guest violinist Christian Tetzlaff on Saturday, February 23 at 7:30 p.m. The program includes MTT conducting Ligeti’s Violin Concerto and Dvořák’s Symphony No. 8, and a second performance takes place the following afternoon in the concert hall only. NWS Fellows are coached this month by nearly 20 visiting faculty—mostly orchestra principals—from around the country. Fellows not only benefit from their coaches’ musical insights, but also from their professional experience, which can range from navigating the world of auditions to achieving balance in their professional lives. This month’s visiting faculty arrives from the Boston, Chicago, Dallas, and Houston Symphonies, the Berlin, Calgary, and Los Angeles Philharmonics, and the Philadelphia Orchestra, as well as from the faculties of the Juilliard School, University of Miami, and University of Wisconsin-Madison. Earlier performances in February include PULSE, NWS’s late-night, club-style concert series; a semi-staged chamber performance of Peter Maxwell Davies’s Eight Songs for a Mad King; and contemporary music with conductor / composer Matthias Pintscher and violinist Renaud Capuçon. Further activities at NWS include an MTT-led conducting workshop, a Fellow-led Inside the Music event exploring Puerto Rican folk music, and a Virtual Hangout in which middle- and high-school musicians can interact in real time with NWS Fellows via Facebook Live. Inside the Music and NWS’s Virtual Hangouts may be streamed for free via NWS’s video platform, MUSAIC.